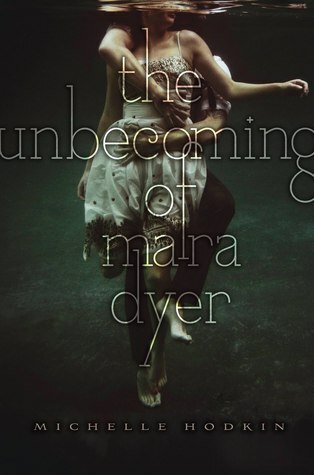 The Unbecoming of Mara Dyer was an unexpected surprise. I honestly bought it on audible because it was part of a 2 for 1 deal that I couldn’t pass up and I was blown away quickly by the narration and the story. Mara has moved to a new town and going to prep school because her best friend, other friend and boyfriend were killed in a building collapse. She was there as well but does not remember what happened. Throughout the book, the memories come back to her, but in the meantime she’s terrorized by hallucinations and frustrated by a cute British boy who will not leave her alone. I hated Noah at first, but slowly came around to him, it doesn’t help that the narrator is spot on with his accent and his outrageous ways. I spent most of the book knowing there was something paranormal coming, but it seems like quite a lot and the fact that she in turn is responsible for others’ deaths haunts her. She literally starts seeing her ex-boyfriend everywhere, only she’s not sure it’s a hallucination. Mara must deal with her crazy and trying to make her psychologist and family believe she only has PTSD, not something much worse. There are some unexplained events that trickle later into the next book, which audible had a sample of and I could not resist buying it with my next audible credit. There are parts that put me off at first, her lack of remorse – although she is dealing with a lot beyond trying to figure out what she did, Noah’s attitude and somewhat mysterious background, and some other mysterious happenings that are not explained away. While it should have put me off, I felt myself more pulled in. Maybe I was just in the mood for a book like The Unbecoming of Mara Dyer, or maybe it was just that the audio version was so well done. A mysterious and intriguing story with characters you love to hate and hate to love. Probably not a book for everyone. I’ve been really interested in reading this book and the whole series. I love the cover. Ah no, the last lines of the summary. “She doesn’t believe that after everything she’s been through, she can fall in love. 🙁 Silly girls always thinking they can’t find/can’t “be” in love and then they do. I’m mildly disappointed, but a romance subplot is kind of a given. I don’t like that you didn’t see a lack of remorse. Although she’s not sure what happened, so it kind of seems to make sense there isn’t a remorse. I LOVED this the first time I read it but the more I thought about it, the more I started to find problematic…but ultimately I think that Michelle Hodkin has tremendous talent, especially with keeping you in suspense! I had to pick up my jaw off the floor after that ending!